Expression Of Gratitude To God Almighty: O give thanks to the Lord for He is good, for His steadfast love endures forever. Our God is indeed the only true God and He alone is God. I Celebrate Him and ascribe all the praises to Him because God Himself is Love. It is His nature and because of Him, love came into existence. In all good things He has created love effulges (shines/radiates). By choosing us to know Him, serve Him and be His children, He has demonstrated unconditional love. Also in the life, He gave to us, the good health, the food we eat, His readiness to forgive our sins and above all in the gift of His only son Jesus Christ, we see the unfathomability of God’s love. Hence I see God’s love as the emblem of today’s celebration; therefore I give God the glory for making today possible and for granting everyone here journey mercies. May His holy name be praised, worshipped and adored forever and ever in Jesus name, Amen. Greetings To My Hero: I wish to acknowledge my noble and Holy father; whom I am very much proud of; His Grace the Most Rev. Prof. Daddy Hezekiah; MFR, NFNY, JP, the Anointed prophet of the Most High God; Founder and Leader Living Christ Mission Worldwide; Proprietor/ Chancellor, Hezekiah University, Ishiala Umudi, the first and only private University in Imo State, Nigeria; Grand Patron, Ambassadors for Peace. Daddym, I am proud of you. Like your father Jesus Christ, you have lived your life solely for mankind. Your love for mankind has placed you in so many hard conditions but you have sworn to your own hurt and have never changed. By next year, you will be celebrating your Golden jubilee, fifty years of Holy, blameless, stainless and selfless service to God and mankind, marked with laudable achievements and investments. It was not all through a bed of roses, but because it was for the people you love, you gave your everything. Thank you my Hero for your love. To my peerless mum Princess Chukwunazaekpere Hephzibah Hezekiah, The Princess of the Most High God; I thank you for your love inspired efforts and contributions to Living Christ Mission family and mankind in general. You are an Angel of God and your love gives me courage all the time. Greetings/ Encouragement To Other Children Of God: I wish to appreciate the hosts of today’s occasion, the lovers of Daddy Hezekiah worldwide and Owerri branch for all they have put in to make today graceful and possible; I pray that God who sees both in secret and in open will reward you magnanimously and mightily through our Lord and saviour Jesus Christ, Amen. In the same vein, I also want to thank the branch (Owerri) for your contributions and support to NALCS IMSU CHAPTER when they hosted me on Saturday the 27th of August 2016. I appreciate in a special way; honourable Dr. Mere for his imputes and supports in all ramifications, thank you very much indeed sir. I also thank all who deemed it fit to grace today’s occasion, leaving your different branches and everything in your schedule to honour this invitation. I thank you all and pray that God will grant you journey mercies to your different destinations, in Jesus name, Amen. 1) It is a worldwide body, not solely Owerri branch. It represents in its entirety all lovers of goodwill who have in them a positive spirit which will always endear them to Daddy Hezekiah and agree with him both spiritually and physically. 2) It shows your believe in my love for Daddy Hezekiah, and I must from today know that you look up to me to do everything in my power to show myself a true lover of Daddy Hezekiah. It is not an easy task considering the nature of the being and personality ‘Daddy Hezekiah’, but I trust God to give me the grace never to fail you in Jesus name, Amen. I pledge to do everything in my power to live up to expectations and I earnestly need your prayers and support, so help me God in Jesus name, Amen. The Theme Of Today’s Occasion: The theme of today’s occasion is love. It is almost the highly overused word in the world today; only very few people understand its implications. Today if I should ask, who the lovers of Daddy Hezekiah are, I am sure everybody would claim to love him; but how many of us will not be convicted in our hearts? How many of us will be convinced deep down in our hearts that we have genuine love for Daddy Hezekiah? If you were to be judged by 1st Corinthians 13: 1-13 would you be found wanting? If you love Daddy Hezekiah, you will love his children worldwide, you will care about his feelings, and you will seek his happiness. When we fight one another, fill our hearts with jealousy, envy and all sorts of wickedness; when we cause confusion in our different branches, disgrace ourselves by appearing naked at the church and on face book, have we really cared about our father and his feelings? Some of us have insisted in our own ways, and despite Daddy’s efforts, sound preachings, fatherly love and frequent forgiveness, we choose to make him feel he is doing nothing by blindly, arrogantly and disrespectfully repeating our mistakes. When you get home today, ask yourself if really you have love for this man Daddy Hezekiah, who has given everything for your sake all his life. It is said, “Let no one who loves be called altogether unhappy because of the challenges, bitterness and heartbreak it could bring because even unreturned love has its rainbow.” In other words, think not that you cheat Daddy by making his love one sided. You lose while he gains because love has become part of him, he derives satisfaction in loving and even though you fail to return his love and throw it to the dust an awesome reward from the living and the most High God for selfless service and love awaits him in HEAVEN and that is the greatest consolation. The Importance Of Building A Befitting Temple For God:I feel different and elated being in Owerri branch today, because of the feeling of hope that in no distant time a befitting temple will be erected for God to dwell in. I am very grateful to God because we have all desired and looked forward to this day. My beloved father Daddy Hezekiah rightly said that Owerri branch is the centre of evangelism. It is very important that a befitting temple is built to this effect since it is the capital of Imo State. Also it will be a proof to people who look down on our church as a mushroom church and want to relocate it, that Living Christ Mission is a Great church with Great future. Despite David’s good relationship with God, God still shifted the task of building a temple for Him to Solomon the son of David because he David was surrounded by great enemies, he was a mighty warrior who fought many wars; 1st Chronicles 28:3-8. Therefore count yourselves blessed to be alive not only to witness the foundation and the building of the temple but to do everything in your power to see that you are part of the exercise, either financially or in labour; by so doing you attract God’s blessings, promises, happiness and you will definitely be proud of your church. The children of God will feel very comfortable in the house of God, they will start thinking differently, having initiatives. A new spirit will dwell in the branch as in the time of Solomon and God will appear in his glory as he promised in Haggai 1:8. In Haggai chapter 1, God told the Israelites that they do not prosper because instead of rebuilding the house of God they count it worthless yet they live in paneled houses and pursue their selfish gains. Therefore want, drought and hardship befell them. They could not prosper until God stirred up their heart to work in his house. 2) 1st Kings chapters 7 and 8; 1st Chronicles chapters 28 and 29; the standard of God requires you to try in faithfulness and holiness to give God the best and all hands should be on deck towards this. You should not leave it to very few persons and feel less concerned. 4) Psalm 132; the secret of David’s success and how he made reference to his contributions and desire to build God a house, as a challenge to ask something from God. 5) When Solomon had completed the temple, its dedication and how they could establish a covenant with God. The bible recorded that the glory of God present in the temple prevented the priests from going close to the sanctuary 2nd Chronicles chapters 6 and 7. It also recorded that a new spirit possessed the children of God that multiple donations were given, joy and peace were established that the poor also had a sense of belonging. c) Whatever you do for God, bear it in mind that it is for your own good. Like my father Daddy Hezekiah, these are what I also say to you today. I pray that God will provide the lamb for sacrifice as he did for Abraham and our father, Daddy Hezekiah in Jesus name, Amen. Advise To Children Of God: I say no new thing to you today other than what our beloved Father said to us in the book of Deuteronomy 30:15-20. He told us that he has set before us, life and death, blessings and curses. It is your duty to choose this day what you want, life or death, curses or blessings. It is your choice and the life you choose to live from today will determine it. In Deuteronomy 28, it was clearly stated, the good part and its rewards, the bad part and its negative rewards; you have two hands to choose the one you will place your head on. Mind what you do or say, be careful about what you hear Luke 8:18 it can influence you. Remember if you love Daddy Hezekiah you will have his interest at heart and in all your conducts care about what he would feel if he hears what you have done. Always sow to the spirit for it gives life and avoid gratifying the flesh, which ends up destroying its victims Galatians 6:7-8. God is a God of freewill, but do not use your freedom as an opportunity for the flesh, but through love, be servants of one another; Galatians 5:13. Conclusion: I appeal to the youths to see that the house of God is neatly and well kept. Do not abandon the house of God. Remember that our father Daddy Hezekiah as a youth, mobilized people to go and work in the church at Saint Paul’s church Nkwerre, Imo State. Let us learn from him and assume our responsibilities as youths, fathers and mothers in the house of God. If you are not faithful in what our beloved father Daddy Hezekiah has, no one will give you your own. Once again, I thank God the father, Son and Holy Spirit the architect of today’s event. I appreciate my beloved father Daddy Hezekiah the factor that has brought us all together as one family. I also thank the icon of peace and unity in Living Christ Mission, my beloved, humble and dearest Mummy Chukwunazaekpere. I also thank everyone here today. May God reward you immensely. I appreciate the organizers of today’s programme and all you have done to keep me and my entourage, including all children of God from different branches very happy and comfortable. I pray that God will reward each and every one of you according to His riches in glory, and grant us His journey mercies in Jesus name, Amen. The Lord bless you and keep you, the Lord make His face to shine upon you and be gracious to you; the Lord lift up His countenance upon you and give you peace, Amen. The Grace of our Lord Jesus Christ, the love of God and fellowship of the Holy Spirit, be with you all in Jesus Christ name, Amen. 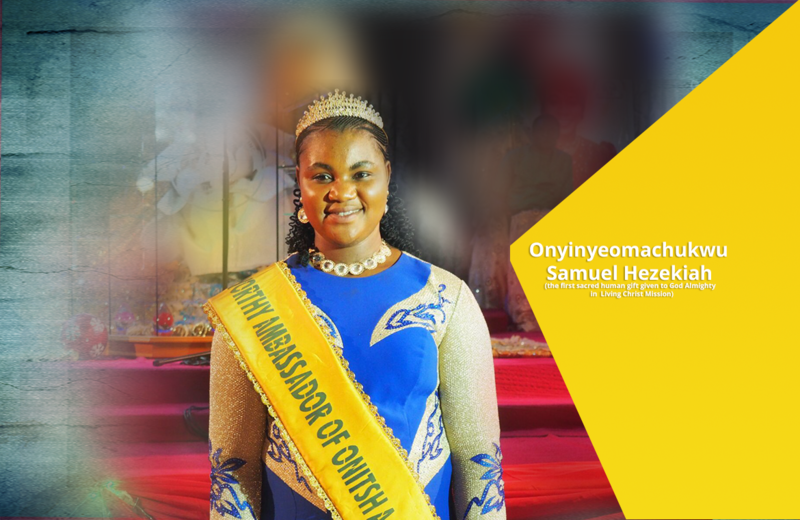 Signed: Princess Onyinyeomachukwu Samuel Chinyere Precious Divine-Gift Hezekiah. The Hero Among Students Distinguished Royal Ambassador of the FCT Abuja.